Government health and nutrition programs substantially reduce anaemia in children under five years of age and expectant mothers but fail to focus on girls and non-pregnant women, according to a study by the International Food Policy Research Institute (IFPRI). Considerable progress was made in India between 2006 and 2016 in reducing anaemia in children under five years of age and pregnant women, showed the study titled “Trends and drivers of change in the prevalence of anaemia among 1 million women and children in India, 2006-2016,” published in BMJ Global Health journal. However, there was minimal progress in the anaemia status among teenage girls and women under 50. However, Improved public health and nutrition programmes for children under five years of age, and higher education and wealth among expectant mothers substantially contributed to lowering anaemia among these two groups between 2006 and 2016, the International Food Policy Research Institute (IFPRI) said. Anaemia reduction among teenage girls and women under 50 years, however, showed very minimal progress. “More than half of the population of women and children in India is anaemic and is, therefore, currently experiencing reduced quality of life in various respects such as work capacity, fatigue, cognitive function, birth outcomes and child development,” said Phuong Hong Nguyen, lead author and IFPRI researcher. “In addition to describing the problem, showing slow improvements, and showing high variability between different states, our paper identifies drivers of anaemia from a broad set of potential drivers at various levels,” Nguyen added. The study, “Trends and drivers of change in the prevalence of anaemia among one million women and children in India, 2006-2016”, co-authored by IFPRI’s Samuel Scott, Rasmi Avula, and Purnima Menon; and FHI360’s Lan Mai Tran, was published recently in BMJ Global Health journal. 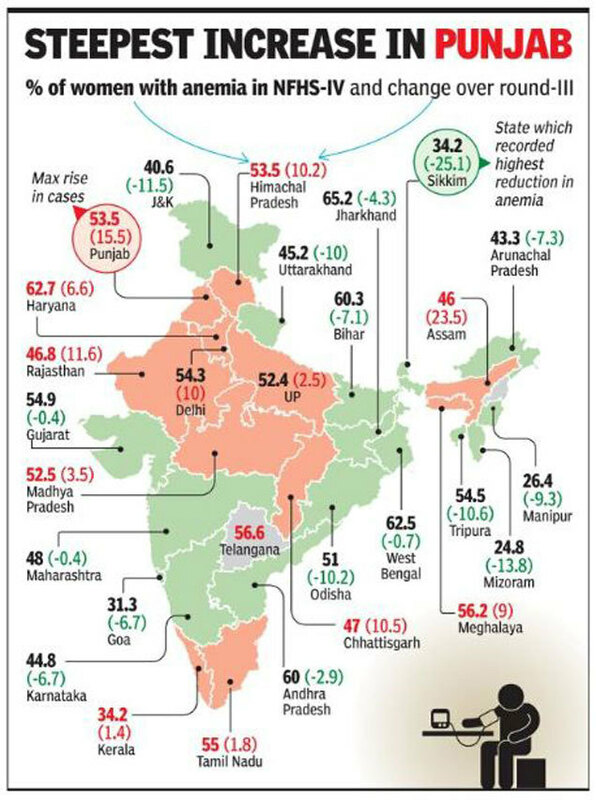 Using data from two rounds of the National Family Health Survey conducted in 2005-06 and the latest one in 2015-16, the researchers examined changes in haemoglobin and anaemia among a million women and children in India, and to identify key factors contributing to lowering anaemia prevalence in the country. Among various drivers, positive changes in mothers’ education, coverage of nutrition and health interventions, socioeconomic status, sanitation and meat and fish consumption contributed to improvement in the haemoglobin count — low haemoglobin count indicates anaemia — among both children and pregnant women during 2006-16. Better education alone accounted for nearly one-fourth of the improvement seen in the haemoglobin count among expectant mothers, and one-tenth in children. “Further improvements in these common drivers can substantially impact maternal and child anaemia, simultaneously bringing down anaemia prevalence across the country in these two groups,” said Nguyen. Haemoglobin and anaemia improved significantly among children less than five years; and pregnant women 15-49 years old, but not in the non-pregnant women in the same age group between 2006 and 2016. Anaemia declined by 11 percentage points among children (70 per cent in 2006 to 59 per cent in 2016), 7.6 percentage points among expectant mothers (58 per cent to 50.4 per cent), and a mere 2.1 percentage points in teenage girls and women under 50 (55 per cent to 52.9 per cent). “It’s surprising that no progress has been made in reducing anaemia among non-pregnant adult women in India in the last decade. Most programmes have not focused on this group but, instead, have focused on pregnant women and young children,” Scott said. India’s recently launched Anaemia Mukt Bharat initiative puts the focus on women of reproductive age (20-49 years), who will start receiving weekly iron-folic acid supplementation, which supports the finding on the need to attend to this population segment. In addition, the Centre has mandated the fortification of salt with iodine and iron, and wheat flour with iron, folic acid and Vitamin B-12.